At Milk and Honey Photography we really wanted to choose a local charity to partner up with to help make a difference. We felt that by doing a project involving mothers and daughters FOR mothers and daughters we could raise awareness of this wonderful organisation and the work they do! The full $50 session fee will go directly to the Generous and the Grateful. So how does the Mothers and Daughters project work? 1) Complete the form below to apply to be part of our project, we want to know a little about your family and your availability to be a part of the project. 3) Once we have confirmed a date for your session, we will send you a link to pay the $50 donation. This will be donated directly to the Generous and the Grateful and locks in your session time. It covers your session, and guarantees that an image of you and your daughter/s will be included in our online project. 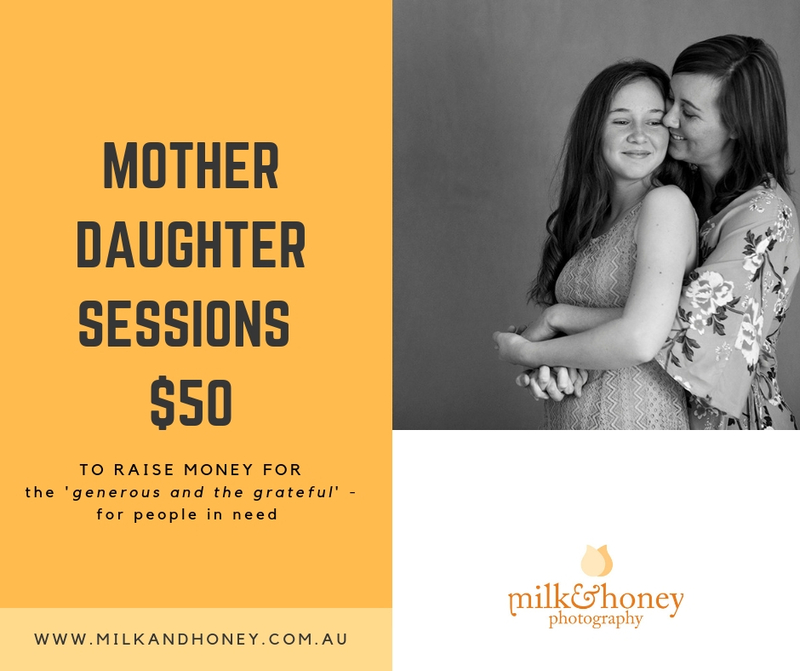 5) You will have an enjoyable photography session in our studio in Summer Hill, where we will capture some beautiful images for you to treasure! It is a great experience for your daughter/s too! Fill in the form below to apply to be a part of this project! The idea of the project is to show off the beautiful bond between with mothers and daughters but we don't like to leave anyone out so please feel free to include dads and sons too! What is the best day for your session? There will be an opportunity to purchase prints and files from your session with fine art prints starting from $95 and file packages from $595. We also have framed fine art prints and album options for your beautiful images.